Represents a selection control that combines a non-editable text box and a drop-down containing a list box that allows users to select an item from a list. ComboBox Initializes a new instance of the ComboBox class. .
IsDropDownOpen Gets or sets a value that indicates whether the drop-down portion of the combo box is currently open. IsEditable Gets a value that indicates whether the user can edit text in the text box portion of a combo box. This property always returns false. IsSelectionBoxHighlighted Gets a value that indicates whether the SelectionBoxItem is highlighted. ItemContainerStyle Gets or sets the style applied to the container generated for each item in the combo box. MaxDropDownHeight Gets or sets the maximum height of the drop-down that lists combo box items. SelectionBoxItem Gets the item displayed in the selection box. SelectionBoxItemTemplate Gets the template applied to the selection box content. In Silverlight for Windows Phone Windows Phone OS 7.1, this member is inherited from Control.OnTextInput(TextCompositionEventArgs). DropDownClosed Occurs when the drop-down portion of the combo box closes. DropDownOpened Occurs when the drop-down portion of the combo box opens. IsSelectionActiveProperty Identifies the IsSelectionActive attached property. The text box either displays the current selection or is empty if there is no selected item. The following illustration shows a combo box control. If you populate a combo box with items that inherit from UIElement, the selected item can only appear in the visual tree one time. This means if an item is selected, it will appear in the selection box, and not in the drop-down list of items. When it is no longer the selected item, it will reappear in the drop-down list. If items do not inherit from UIElement, they can appear in both the selection box and the drop-down list at the same time. ComboBox is an ItemsControl, which means it has an associated item container, ComboBoxItem, which contains individual pieces of content in the control. A ComboBoxItem is created for each item in a collection and can be retrieved, whether or not you create it explicitly. You can retrieve ComboBoxItem container objects by using the ItemContainerGenerator property associated with the ComboBox control. You populate the ComboBox by using the Items or ItemsSource properties. For more information, see Control Content Models. You can retrieve the combo box's selected item by using the SelectedItem property, or retrieve the index of the selected item by using the SelectedIndex property. You can apply a style to each item displayed in the ComboBox by setting the ItemContainerStyle property. To apply the same property settings to multiple ComboBox controls, use the Style property. To change the visual structure and visual behavior of a ComboBox, copy and modify its default style and template. For more information, see Control Customization. Dependency properties for this control might be set by the default style of the control. If a dependency property for a ComboBox is set by its default style, the property might change from its default value when the ComboBox appears in the application. For more information, see Dependency Property Value Precedence. You can get the default style and template for ComboBox from ComboBox Styles and Templates. 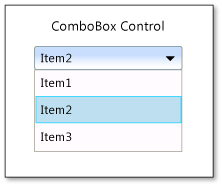 Setting a visual property will only have an effect if that property is both present in ComboBox control's default template and is set by using a TemplateBinding. You can find a list of visual properties in the "Changing the Visual Structure of a Control" section in Customizing the Appearance of an Existing Control by Using a ControlTemplate. The following example demonstrates binding a combo box to a collection of FontFamily objects.